Have you found the perfect lamp base but you’re struggling to find the right lamp shade? If so, this post is for you! 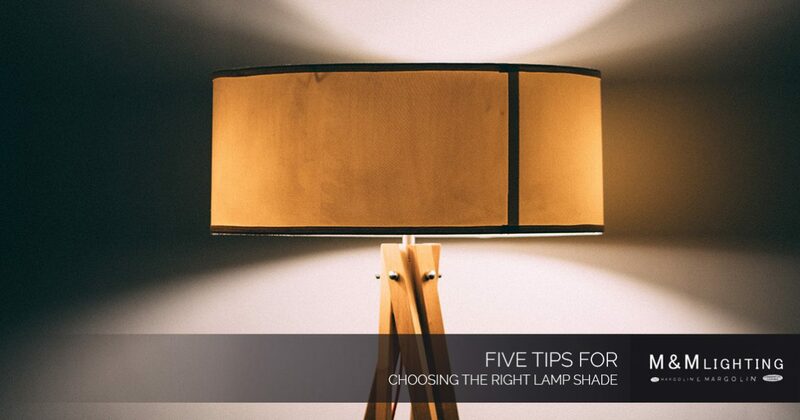 Choosing the right shade for your desk lamp or floor lamp might feel overwhelming, but when you consider the five factors below, it can be easier than you think. Read on to discover a few helpful hints for choosing the best size, shape, translucency, material, and finishing touches to ensure your lamp shade works well with the lamp and your room’s design scheme. At M&M Lighting, we have thousands of lighting products for our customers to choose from, including beautiful lamp shades. Whether you browse our online catalog or stop by our Houston showroom, you’re sure to find the shade you’re looking for. Let our lighting experts help you today! Choosing the right size of lamp shade can be tricky, but with a bit of simple math, you can be well on your way to creating a stunning lamp. For the height of the shade, try to adhere to the “40 percent” rule. That is, when you consider 100 percent of your lamp’s height, the shade should make up about 40 percent of that. Determining the best width is easy: simply choose a shade that is approximately double the size of the base. For example, if your base is eight inches wide, a lamp shade that is around 16 inches wide will create a pleasing visual balance. When you are shopping for lamp shades, it is also important to consider how much light you would like the lamp to give off, and what type of mood you hope to set in your room. If you want a bright, cheery atmosphere and increased ambient light in a room, a transparent shade is your best bet. Because they don’t allow light to be filtered through the shade and instead direct light up and down, opaque shades are wonderful for creating a dramatic mood. Semi-transparent shades provide ample task illumination while also acting as a design element in a room. If you are uncertain which shape will best complement your lamp base, the lighting specialists at M&M Lighting are happy to help! Schedule an appointment with one of our lighting experts today! The type and color of material that the shade is made from will be one of your biggest style considerations, and whether you choose a leather lamp shade or a glass Tiffany shade, you want to be sure that it complements the rest of the room’s design and your aesthetic preferences. For example, smooth shades provide an elegant and modern appearance whereas pleated shades work well to create a more traditional-looking lamp. Additionally, you want to take the color and material of the base into consideration when choosing the material for your lamp shade to ensure your lamp has a cohesive style. Lastly, if you are someone who prefers to add a little extra charm to your lamp, many shades are secured to the base with a finial. Choosing the right finial gives your fixture that final touch of elegance and style to complete the look you were aiming for. Available in a wide variety of finishes, shapes, and styles, you’re sure to find one that enhances the overall appearance of your lamp. 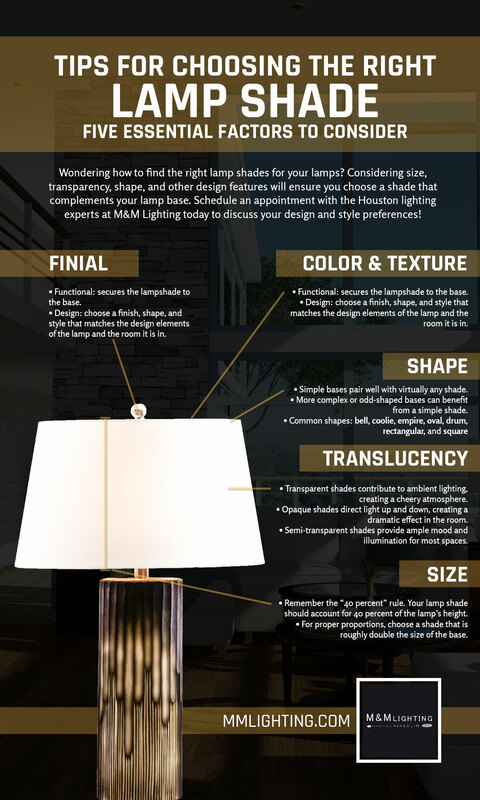 Looking for the perfect lamp shade in Houston? M&M Lighting is here to help! With more than 50 years of experience, our lighting experts have what it takes to help you design lighting solutions that will suit your budget and your style preferences. Call us at 713-469-3002 to schedule an appointment or swing by our stunning lighting showroom located at 5620 S. Rice Avenue in Houston. We look forward to helping you!